Describe Foreign Direct Investment and it’s Problems. Foreign Direct Investment (FDI) is the acquisition of managerial control by a citizen or corporation of a home nation over a corporation of some other host nation. Corporations that widely engage in FDI are called multinational companies, multinational enterprises, or transnational corporations. FDI traditionally implies export of real capital from home to the host nation, but even when economic investment results from FDI, capital may not be transferred from the home nation to the host one. Rather, multinational corporation may acquire/utilize real capital from local (or a third-nation) sources foreign capital” means capital invested in Bangladesh in any industrial undertaking by a citizen of any foreign country or by a company incorporated outside Bangladesh. In the form of foreign exchange, imported machinery and equipment, or in such other form as the government may approve for the purpose of such investment;.Bangladesh invites FDI for industrial growth, in particular welcoming establishment of manufacturing firms and service sector enterprises that would sell their products within the country and also export outside it. If a country’s inflation rate increases relative to the countries with which it invests, its capital account would be expected to decrease, other things being equal. Consumer and corporations in that country will most likely purchase more goods or invest more in overseas (due to high local inflation), while the country’s exports to other countries & flow of investment from foreign will decline. If a country’s income level (national income) increases by a higher percentage than those of other countries, its capital account is expected to decrease, other things being equal. As the real income level (adjusted for inflation) rises does consumption of goods. 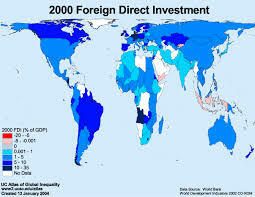 A percentage of that increase in consumption will most likely reflect an increased demand for foreign investment. A country’s Government can prevent or discourage investment from other countries. By imposing such restrictions, the Government disrupts investment flows. Among the most commonly used investment restriction are bureaucratic tangles, projection of intellectual property right and f\fiscal policy changes. In addition to these, a Government can reduce its country’s investment by enforcing laws, or a maximum limit that can be invested. Each country’s currency is valued in terms of other currencies through the use of exchanges rates, so that currencies can be exchanged to facilitate international transaction. The values of most currencies can fluctuate over time because of market and government forces. If a country’s currency begins to rise in value against other currencies, its capital account balance should decrease, other things being equal. As the currency strengthens, Investment by that country will become more expensive than the receiving countries.